In 1933, with America five-years deep into The Depression, the stage was set for an act of unprecedented proportions. History shows a wicked warlock at work. On March 6, 1933, Executive Order (EO) 6073 was passed by Franklin Delano Roosevelt (FDR), the 32nd President of the United States in an attempt to solve the dire banking crisis. Executive orders have been around since 1789, allowing Presidents to issue legally binding orders unilaterally, without the consent of Congress. During his Presidential tenure, from 1933 to 1945, Roosevelt would issue 3,728 Executive Orders. Just two days after Roosevelt was inaugurated as President, he proclaimed a “banking holiday”. From and including Monday, March 6, 1933 to Thursday, March 9, 1933 no bank “would pay out, export, earmark, or permit the withdrawal or transfer in any manner or by any device whatsoever of any gold or silver coin or bullion or take any other action which might facilitate the hoarding thereof…” Sold to the American people as an attempt to control speculation and regulate interest rates, he closed America’s banks, thwarting customers from withdrawing their paper money holdings or converting their holdings to gold. With a swish of his magic wand, Roosevelt mastered “complete control over America's banking system”, expanding his Presidential powers exponentially in the process. On June 16, 1933, EO 6073 passed into legislation as the “Emergency Banking Act (EBA)”. After only 40 minutes’ debate in the House of Representatives, with an unknown author and no printed copies available for members of the House, the Bill was passed swiftly and without due process. The wand was waved again. Meanwhile, Executive Order 6073 paved the way for Executive Order 6102 on April 5, 1933. 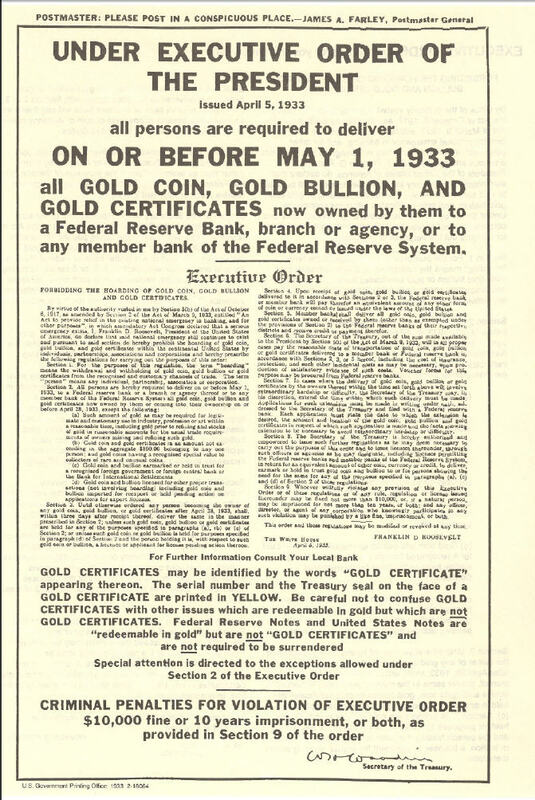 This Executive Order (EO) made it a criminal act to possess gold coins, gold bullion and gold certificates within the continental United States and ordered that the hoarded gold be delivered to the Government on or before May 1, 1933. The official price of gold was raised from $20.67 to $35/ounce. Although it is unknown just how much gold was confiscated by means of Executive Order 6102, numbers suggest that by January 1934, there were 195.1 million ounces and 227.9 million ounces by August 1934. The Government had to have some place to hoard the confiscated gold. So, Executive Order 6102 paved the way to Fort Knox. The U.S. Treasury Department began construction of the United States Bullion Depository (USBD) in 1936. Completed in December of that year, at a cost of US$560,000, the Gold Vault sits in a 109,000-acre Army enclave in Fort Knox, Kentucky. The U.S. Mint states that 147.3 million ounces of gold are now tucked into Fort Knox. Guarded by Apache helicopter gunships and tucked into a bunker with a bomb-proof roof and thick granite walls, you’d think that 147.3 million ounces of gold would be safe in the vault. While Treasury officials insist that the “gold is all there”, why the resistance to a public audit? 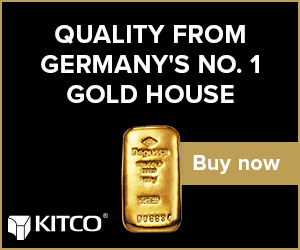 Congress begs off, saying it will cost US$60 million to test the gold. Other figures bandied about suggest US$15 million. Other so-called experts contest both figures, stating that an independent audit and assay could be conducted for as little as US$15,000. More nefarious are that the numbers don’t add up…and never have. In his article The Great American Disaster: How Much Gold Remains In Fort Knox?, dated August 27, 2010, Chris Weber states that, at their peak in 1949, the Fort Knox reserves reputedly numbered 701 million ounces – 69.9% of all the gold on the planet. The latest figures reported by the U.S. Mint state that 147.3 million ounces of gold are now tucked into Fort Knox. Treasury subsequently downgraded this figure from 264 million ounces of gold, a decline of 79%! Lucy, you got some ‘splainin’ to do. Clearly, the road to – and from - Fort Knox is paved in gold and not-so-gold intentions. Tales of pillaging, profiteering and skullduggery abound at the crossroads of Bullion Boulevard and Gold Vault Road. Masked interlopers didn’t rob the USDB. Reputed to be the second most secure place in the world (as reported in The Blogington’s post of September 21, 2010), the video cams, armed guards, attack helicopters, armored personnel carriers, and 30,000 soldiers guarding Fort Knox guaranteed that. For over 50 years, while domestically it was a crime to hold gold, there is little doubt that well-heeled Americans - and America’s enemies, operating offshore, were able to procure gold at the bargain basement price of $35/ounce. Not surprising that Fort Knox’s 22-ton door is locked to an audit. For almost 40 years, no visitors have been allowed in the grounds of the Gold Depository. Considered one of the eight most secure places in the world, we’re not getting in for a sneak peek anytime soon. In the last recorded “audit”, in the early 50’s, a group of Congressmen and Senators were taken on a quick tour of Fort Knox and allowed to peek into a few vaults. They reported seeing “orange-hued gold bars”. Lucy, you got more ‘splainin’ to do. “The only audit that has ever been done of the gold inside Ft Knox was done days after Dwight Eisenhower became President in January of 1953. After 20 years of Democratic presidents, the American public wanted to be sure that the gold confiscated from them was still there. Thus, the new President ordered an audit within hours after taking office. Representatives of the audited group were allowed to make the rules governing the audit. No outside private experts were allowed. Those government bureaucrats involved were inexperienced in their tasks, by their own admission. The entire audit of the largest gold hoard ever concentrated in history lasted only seven days. Only a fraction of the gold was actually tested. Later, the officials put this fraction at just 5%. Based on that fraction, the official committee reported that, in their opinion, all the holdings would have matched their records if they'd all been tested. On September 23, 1974, Mary Brooks, the Director of the United States Mint, led a tour of members of Congress and the news media through the USBD. There was no audit or inventory of the gold and no other public “inspection” has been allowed since then. Why won’t the Mint comment about how much gold is there? Perhaps the acid test is not so much as what has happened to the gold in Fort Knox; but rather is there gold in Fort Knox? And if so, how much…..or how little? In a feat worthy of The Great Houdini himself, the Fort Knox gold may be the World’s Greatest Vanishing Act ever. There are other ways to take advantage of gold’s next bull market that can add leverage and protection against a gold confiscation. One of the best ways is through the ownership of gold producing companies. The key here is in buying the right companies as the right time within the market cycle. Apr 23 Can Gold Rise Without a Rate Cut?